The question for would-be backers of Melbourne Cup betting favourite Yucatan isn’t whether his Herbert Power run is good enough, because it surely is, but whether he will repeat it. On Tuesday, he lines up for the 158th edition of the Cup as a worthy market leader at 4.60 with BetStar, and could well be the one to hand trainer Aidan O'Brien a first victory, but Rory Delargy is not convinced. He's picked two other horses for you to bet on the Melbourne Cup. The world's richest handicap, run over 2m, The Cup is a fascinating affair, first held in 1861. As early as 1865 the day of the race was declared a half-holiday in the city, with the popularity of the race growing accordingly. The roll of honour includes such legends as Carbine, Phar Lap, Peter Pan and more recently the mare Makybe Diva, winner of three Melbourne Cups in succession from 2003-2005. In the early years, the rivalry was between local runners and those travelling from New South Wales, while at other times the race was dominated by horses emanating from New Zealand, but in the past 25 years, the race has become one of truly global importance and with a global cast to go with it. Hoping to sort the Melbourne Cup by concentrating on European or ex-European runners is a bit of a waste of time, with the top half of the betting dominated by such runners - only Turnbull Stakes runner-up Youngstar represents local interest. It's the name on everyone’s lips after his stunning debut in Australia, winning the G1 Herbert Power Stakes eased down in stunning fashion. That performance is surely good enough, but the son of Galileo is not at all sure to be suited by the step up to the near two miles of the Cup itself. He was also a frustrating performer prior to reinventing himself at Caulfield. Herbert Power winners don’t have a great record in the Cup in recent times. Since Arwon did the double in 1978, only Rogan Josh (1999) has matched that feat. Magic Circle has improved at six, having joined the yard of Ian Williams, and has won both starts in Britain this year by wide margins - the Chester Cup and the Henry II Stakes at Sandown where he beat Red Verdon easily. He looks the ideal type in that he displays a genuine combination of stamina and finishing speed, and notions that he’s too exposed in his fifth season of racing are brushed aside when looking at the pattern of his form. Clearly progressing all the time, despite being pigeon-holed as a mere handicapper until recently. Much of his form is on easy ground and, given he stays beyond two miles, he might prove vulnerable on a quick surface. Cross Counter won the Gordon Stakes at Goodwood and finished in front of St Leger winner Kew Gardens when second in the Group 2 Great Voltigeur at York, plus he is unexposed and lightly-weighted on 51kg. On the flip side, he’s done his winning in small fields, has no experience of a race like this, and has met with a minor training setback, which tempers any confidence. He’s also unproven beyond 1m4f, which isn’t always a problem with horses conditioned in Australia, but of those shipping in to the Cup, it’s those proven beyond that trip who have tended to fare best. I have a lot of time for Muntahaa; he defied a BHA mark of 109 when winning the Ebor at York, returning to the form which saw him start second favourite for the St Leger as a three-year-old. In comparison, Magic Circle was 8lb lower when winning the Chester Cup, so that puts the task he completed in some context. He’s always been a flighty sort, and it has taken his trainer John Gosden time to harness his full talent, but he showed at York, when forced to race wide of his field in the early stages, that he has grown up an awful lot, and he looks to be peaking at just the right time. 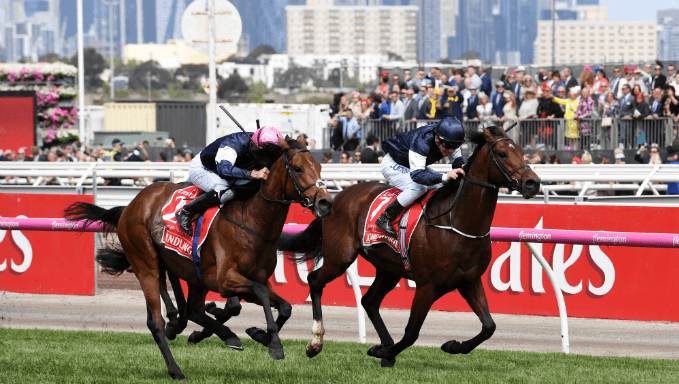 The Ebor has been the best British guide to the Melbourne Cup, and although no horse has done the double, Ebor winners Quick Ransom (4th), Give The Slip (2nd), Purple Moon (2nd), Heartbreak City (2nd) and Nakeeta (5th) have all run with great credit. He’s not reliant on luck in running, but rather good judgement of pace from his rider, and represents Sheikh Hamdan al Maktoum, who owned previous winners At Talaq and Jeune. Finished ahead of Rostropovich in the Cox Plate and chased home Cracksman in the Prix Niel last autumn, but doesn’t appeals as having the stamina for this contest (barely stayed 1m4f in France) , and looks poorly priced on the balance of his form for both Andre Fabre and James Cummings. He ran an impressive trial when narrowly winning the Caulfield Cup from Coolmore-owned duo Homesman and Cliffs of Moher (now The Cliffsofmoher) despite starting badly from a wide draw. That was his third consecutive win at Group 1 level, and he is weighted accordingly. Given Caulfield was his eighth start of the year, it’s hard to imagine he will be hitting a new peak on Tuesday. If he does, it would be a great training performance from Saeed Bin Suroor having had him on the go since January. Another whose form is at up to 1m4f. He ran well behind Best Solution, and also when fourth to Benbatl over 1m2f on his Australian debut, but he’s never won beyond that trip, and he’s easy enough to oppose on balance. She has the right kind of European pedigree for this and looks the most intriguing of the Australian runners, having run a huge race to finish second to Winx in the Turnbull Stakes at Flemington last month. She had no chance in a slowly-run Caulfield Cup last time, and is arguably overpriced because of that effort, but the Queensland Oaks winner is open to significant improvement granted a more searching test, and I would not count against her. Marmelo was a big fancy for this a year ago, but disappointed, having run so well in the Caulfield Cup on his previous start. In retrospect it might have been a mistake to give him a prep run rather than sending him to the Melbourne Cup fresh, as he tends to flatten out after a run, on the limited evidence of his career to date. What we do know is that every time he has returned from eight weeks or more off the track, he has either matched or improved on his previous form. Going straight to the Cup on his first start since August looks the correct approach, and he looks sure to go well. He’s got a similar weight to last year, and a better prep, so his odds of 18.00 are very attractive when considering he was 6.00 favourite 12 months ago. He was put in his place by Winx in the Cox Plate. It’s possible to make excuses for him with the tempo of the race not helping to establish the merit of the race as a whole, but he’s got a fair bit to find on the balance of his form, with his excellent effort in the Irish Derby a bit of a standout on the figures, and again coming off a messy gallop. From evidence collated above, you can narrow this field down to two: the stand-outs on form and odds being Marmelo (18.00 Unibet) and Muntahaa (11.00 Ladbrokes).